The Villa Artemisia is perfectly located just behind the Coral Bay main strip and within a few minutes’ walk of the wide selection of restaurants, cafes, supermarkets, and the sandy beach. 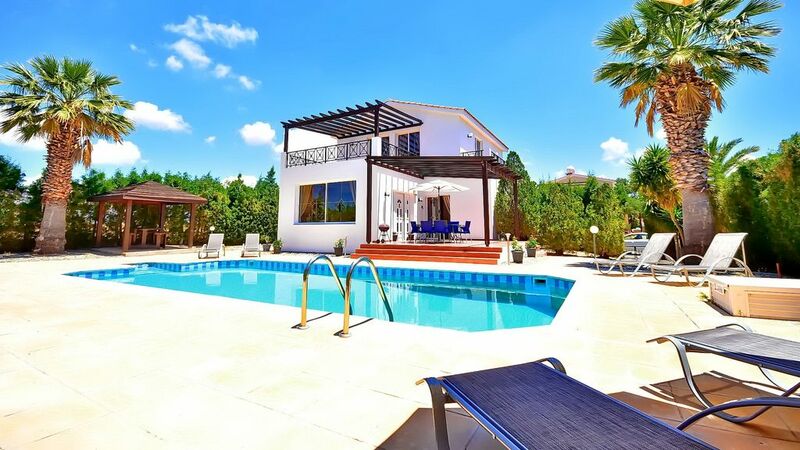 The villa is a luxury private detached three bedroom three bathroom villa in the heart of Coral Bay with own private 5m X 10m pool (walk-in steps) and offers complete privacy and seclusion from neighbouring villas. The property benefits from mature private grounds, shaded outdoor dining area overlooking the pool, complete set of outdoor furniture including sunbeds and umbrellas, barbecue, and complete privacy. Inside, the villa has been completely newly furnished and offers three bedrooms, of which two are doubles and one is a twin. All three bedrooms are air conditioned and all are en-suite. The villa benefits from air conditioning throughout, wi fi, and UK and SKY TV. toilet, shower, En suite to the ground floor twin bedroom. toilet, shower, En suite to the first floor twin bedroom. toilet, combination tub/shower, shower, Ensuite to the first floor double bedroom. Golf is available at Tsada Golf Coarse and Aphrodite Hills which are about 15 minutes drive away. Private 9m X 5m pool with walk-in steps. Private and not overlooked with a full collection of outdoor furniture for 6 persons including sunbeds and umbrellas. The villa offers a large open-plan living room/kitchen/dining area with large windows overlooking the pool area for maximum light, leather lounge, new dining area, and a fully fitted kitchen which includes gas cooker, fridge/freezer, washing machine, and dish washer. There are three bedrooms including one double and two twins, all with en-suite bathrooms, fitted wardrobes and air conditioning, with one bedroom on the ground floor and two on the first floor of which both have access to the balcony which offers pool views. The outside areas are enclosed and the boundaries are lined with tall trees offering complete privacy and seclusion. The villa is equipped with wi fi. The property will appeal to guests who are looking for a spacious private villa within the centre of Coral Bay which offers complete privacy, and without the necessity of having to hire a car for their stay. Absolutely lovely property, our only complaint was the WIFI was not great. We needed to stay in touch with work and family members, so not ideal. Lovely local restaurants and bars. We recommend Andria's if you like a good steak. Amazing food. Overall the Villa is great, and the pool was really nice too. Lovely location too, we had a great holiday. Really great place to stay, but some areas are a bit tired, e.g., pool isn't tiled, outside steps are broken and mattresses are very uncomfortable, but still a pleasant area with great restaurants and bars. My wife and I along with our grown up children have returned from our stay at Semeli Villa. We were very happy with the location, cleanliness of the villa and amenities. Chris was very helpful prior and during our stay, also we recommend his friend Savvas from whom we hired the car. We have no hesitation in recommending this holiday villa. Thank you for your review. It's always nice to hear that our guests have enjoyed their stay in one of our villas. We look forward to welcoming you to one of our properties again. Das Haus ist ideal für einen Familienurlaub in Coral Bay. Es hat alles was es braucht, ein Küche mit Geschirrspüler und Waschmaschine, genügend Badezimmer, einen Pool, das Gelände ist eingezäunt und einen Outdoor-Grill. Zudem ist die Lage ideal, es gibt in kurzer Gehdistanz einen grossen Supermarkt und viele Restaurants in der Nähe. Der Strand ist innerhalb 7min, zu Fuss zu erreichen. Das Haus ist sauber und gepflegt. Die Küche, sowie die Betten sollte mal erneuert werden. Coral Bay is a self sufficient area offering banks, supermarkets, cafes, bars, and a wide selection of international restaurants and local tavernas. The villa is located in the middle of Coral Bay in a quiet and private area and is within a short walk of all amenities including the sandy beach of Coral Bay. Car is not necessary for this villa. Please note that the rental rates are inclusive of the use of air-conditioning in the bedrooms and there are no added or otherwise associated costs to the villa hire of any nature.